Nerve cells are the most commonly known cells in the brain. Therefore it would be logical to suggest that nerve cells have the majority in the human brain. Yet this not completely right. 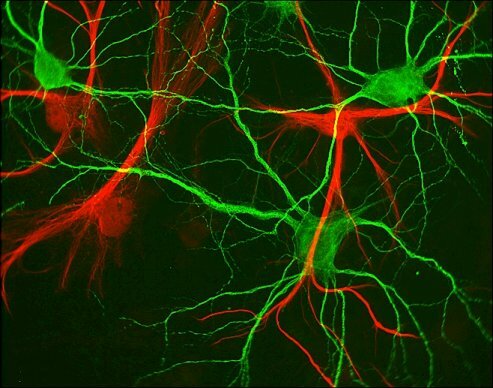 Star-shaped glial cells, the so called “astroglia”. Glial means glue. As befits their name, until now these cells have been regarded merely as a kind of putty keeping the nerve cells together. A couple of years ago, a research team of the National Research Center for Environment and Health already proved that these glial cells function as stem cells during development. 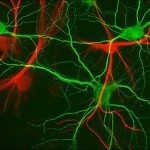 This means that the cells are able to differentiate into functional nerve cells. However, this ability gets lost in later phases of development, so that even after an injury to the adult brain glial cells are unable to generate any more nerve cells. In order to be able to reverse this development, the team studied what molecular switches are essential for the creation of nerve cells from glial cells during development. These regulator proteins are introduced into glial cells from the postnatal brain, which respond by switching on the expression of neuronal proteins. In his current work, Dr. Benedikt Berninger, was now able to show that single regulator proteins are quite sufficient to generate new functional nerve cells from glial cells. The transition from glial-to-neuron could be followed live at a time-lapse microscope. It was shown that glial cells need some days for the reprogramming until they take the normal shape of a nerve cell. These new nerve cells then also have the typical electrical properties of normal nerve cells, which can be shown by means of electrical recordings. The results are very encouraging, because the generation of correctly functional nerve cells from postnatal glial cells is an important step on the way to be able to replace functional nerve cells also after injuries in the brain.